Its a one time thing. Make the most of it with a luxury limo! Once Is Enough. Prom only happens once, but if you do it right that is all you need. This day will be remembered for a long time so do it in style! Our lavish limos are the perfect thing to make this night extra memorable. Go With All Your Friends. Don't leave anyone out. If it's your senior year you only have so many days left with your friends before college. Share this night with the best of friends. Mom & Dad. You can relax knowing that your child is safe with us. Our drivers take their job very seriously and are extremely responsible. We go the extra mile to make sure your high schoolers have a fun but safe night. Don't Worry About Your Ride. Prom puts a lot of pressure on kids to drive nice cars so they can impress their date and their friends. Well, with Vancouver Luxury Limos your ride is as sweet as it could ever be! We know how to help you impress your friends. Trust us on this one. After The Dance. 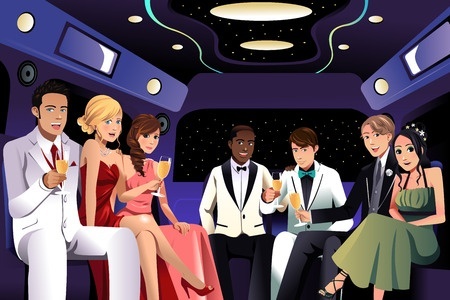 Make Prom last as long as possible by living it up with your friends in a luxurious limo after the dance. Our limos are an absolute blast! Call us at 360-362-8883 or fill out the FREE quote form to make this Prom a fantastic one!